Hundreds of students left in limbo as the K2 towers near Wilfrid Laurier University remain incomplete. Waterloo--After a digital tour of the condo in early June 2016, and a conversation over the phone with an Atlas Properties Group leasing agent, Sarah and David* signed a lease for a two-bedroom suite in the 21-storey K2 condo tower on King St near Wilfrid Laurier University, the larger of a two tower development at the site. David said the two international students then paid a three-month deposit "for our final three months in the unit", totalling nearly $5,000. The occupancy date on the lease was September 3rd, and the two students asked the Atlas leasing agent, allegedly a University of Waterloo student herself, if they could move in early as they were coming from out of town. The pair say the agent agreed and Sarah and David planned to come to Waterloo on August 20th. 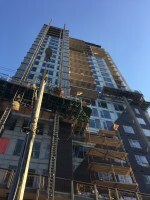 However, in early August, the building's developers UID Development sent renters an email telling them that, due to a "Construction Worker Union strike", units at the larger of the towers at 158 King St N would not be ready for the beginning of September. No firm date was given in the email. David and Sarah were shocked to learn that the suite they had rented was actually in a building still under construction. "The Atlas leasing agent never told us this was a new building", Sarah explained, continuing "when we signed the lease in June, the agent never mentioned that it may not be ready for September." "If the Landlord and/or Authorized Representative is unable to give possession of the Rented Premises on the commencement of the term for any reason, including, but not limited to construction delays or an over holding tenant, the Landlord and/or Authorized Representative shall not be to liable to the Tenant and shall give possession as soon as the Landlord and/or Authorized Representative is able to do so. The Rent shall be abated until possession of the Rented Premises is offered by the Landlord to the Tenant. Failure to give possession at the date of commencement of the term shall not in any way affect the validity of this Tenancy Agreement. This Tenancy Agreement shall be enforceable against the Tenant named herein, regardless of whether such Tenant actually occupies the Rented Premises." Translated to non-legal, the clause states that the landlord is not responsible for any delays in the unit being available, and that if there is a delay, it would not be a sufficient reason to release the renters from the lease. With Sarah and David signing their lease in June, Atlas and UID may have already known that a September move-in was out of the question, yet David says the leasing agent never mentioned the building was yet to be completed. In lieu of completed apartments, UID gave renters the option of moving into one of two hotels, to move into a bedroom in shared student housing, or to delay the start of the lease until the units were ready. The hotels on offer were a Howard Johnson in southern Kitchener and a Travelodge in Cambridge with shuttle buses transporting students to and from campus. The shared housing units, as David and Sarah discovered on touring one, included a "not nice" room in an old home, nothing like the clean apartments still on view on the Atlas website. UID also informed the renters that they would have to pay $600 a month for a room in the shared housing with a $250 key deposit. Hotels would also come with a cost, though the exact details were not clear. If a renter chose to delay the lease start date, they would be credited $400 a month towards their first month's rent, yet have to find their own place to live until K2 was complete. With the September semester approaching at school, and their unit still incomplete, Sarah and David still had to find a new place to live. The pair arrived in Waterloo and rented a hotel room while they tried to deal with UID and Atlas on their housing situation. Now with mid-term exams underway, David and Sarah say they are not interested in waiting for their unit to be completed, they just want their $5,000 deposit returned as they have already found alternate accommodation outside of UID's lacklustre offerings. To this point, UID has refused to refund the money, directing David to the clause in the lease about construction delays. Atlas Properties Group meanwhile, is trying to avoid accountability in the situation, telling David to "deal with UID". In response to the stonewalling, Sarah says she and David went to the landlord and tenant board with the issue and now have a hearing scheduled in late November. As the landlord and tenant board hearing was set, UID sent an update to renters, informing them they would be able to move in mid-November, but with the building still missing its outer skin, and little completed work on the inside of the units, David says he is skeptical that date is realistic. David added that even if the outside was complete, the situation for those living in the 11-storey K2 building next door has given him further reason not to trust what UID is telling him and hundreds of other impacted students and other renters. According to David, in the smaller K2 building that has been occupied since September, the building's interior is not yet complete, with "bedrooms" being set up in common areas of apartment units, separated by half-height paper room dividers. "Only one of these bedrooms has actual walls and a door; the other three, these are not bedrooms," asserted Sarah, adding that "there is no privacy". The picture our news department obtained seems to verify these claims. With many of the impacted renters being international students, paying up to 500% more for school than non-international students, David says there has been little organising among the tenants to work collaboratively for solutions. Sarah explained that many of the students simply took what was offered as they need to focus on their studies, and did not have the energy to confront UID. While the universities have not kept track of the number of students impacted by insecure, inadequate, or non-existent housing, high profile cases have certainly impacted thousands in just the past two years. In 2015, students successfully challenged Schembri property management at the landlord and tenant board when the units and the building they signed leases for were not completed on time. Already this fall, delays in the ICON development left more than a thousand students scrambling to find alternate solutions as they started classes. At the K2 towers, there is a frenzy of construction activity as crews continue to work on the outer walls of the upper-half of the building, but for Sarah and David, the efforts are much too late. As the two prepare for the landlord and tenant board hearings to demand a return of their deposits, and to be released from their unfulfilled lease, they must also prepare for their mid-term exams and keep up with all their other school work.